In one of the most impressive Ignite talks I’ve seen, filmed aboard the SS Great Britain, Oli Humpage makes a mathematical proof dramatic, funny and grippingly entertaining. Bravo! Oh and the talk includes a world record attempt, but blink and you’ll miss it. This week we celebrate ten years of the world’s free encyclopedia. The official birthday is today, being celebrated at hundreds of get-togethers as well as online events. Sue Gardner, Executive Director of the Wikimedia Foundation, has a round-up of some of the more interesting media coverage, including a remarkable column by the vice-president of Oxford University Press and Lifehacker’s How Wikipedia Can Make You A More Tolerant Person. This talk reports some investigations of how obesity, happiness and generosity spread through social networks. James Fowler concludes that you likely have more personal influence over friends and strangers than you think you have. This whimsical Ignite talk gives us the solution to urban congestion which has eluded planners for so long. Continuing the series of posts of Ignite talks, this one is a frank account of how the speaker faced up to a serious illness: Lymphoma. In this Ignite talk, Zoë Keating (who has made some amazing music, live and recorded, using just a cello and some looping/recording electronics) asks whether someone with a job in IT should really be jealous of a musician touring with a rock band. She has been both. The Ignite talks strike me as a well-kept secret on the net. Yes, they vary in quality, but there are gems among them on all sorts of topics, which deserve a much wider audience. To give the series a little boost, I’ll be blogging an Ignite talk each day for the coming week. I start with this recent example, which starts with a funny story about searching on the web but makes a point that online searching is something many of us are getting drawn into for its own sake. Confused by the terminology of open relationships, polyfidelity and closed-group swinging? Where does poly/mono end and cheating begin? Have it all explained with this helpful map by Franklin Veaux. 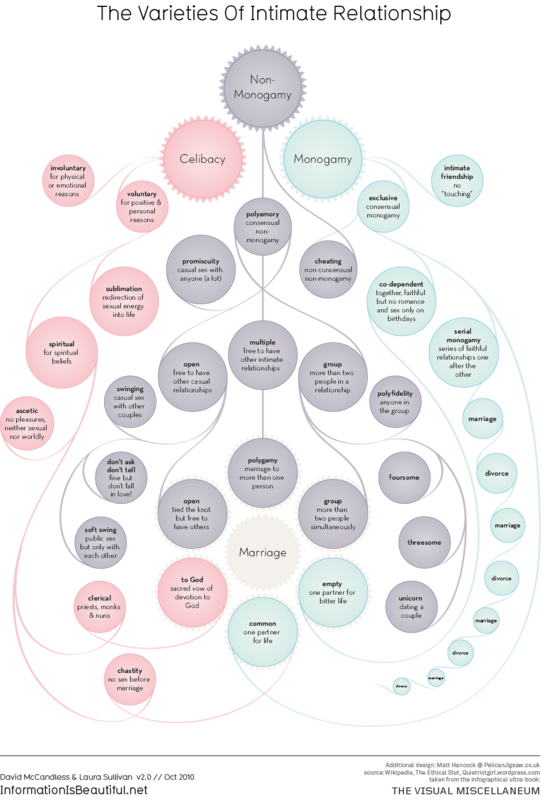 See also Information is Beautiful‘s take on the issue of human relationships. Nice to see climate science getting some good PR for a change. The US National Oceanic and Atmospheric Administration brings together ten lines of evidence, from multiple data sets collected around the world, to show definitively that the world is getting hotter and that the consequences are already here. Will mario be required for a plumbing certificate?